TORONTO, ON (Canada) – New research by University of Toronto (U of T) neuroscientists sheds light on links between early brain growth and sensations experienced by animals soon after birth. The findings suggest mobility restrictions or insufficient sensory stimuli impact the production of new brain cells – known as neurogenesis – and brain growth. The likely outcome is that learning and cognition are negatively affected. 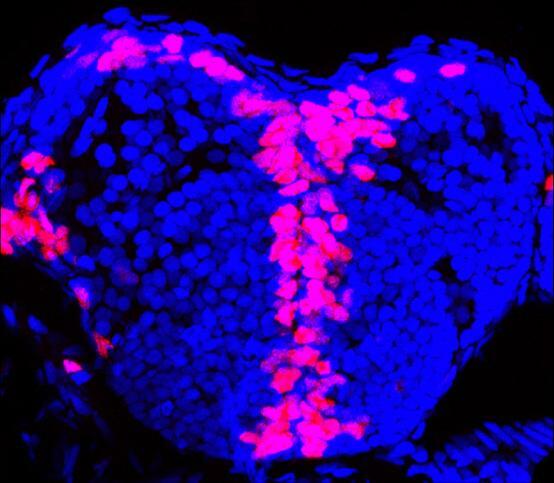 "We have identified a form of neural feedback in zebrafish that could link development of the body with that of the brain," said Zachary Hall, postdoctoral fellow working with developmental neurobiologist Vincent Tropepe in the Department of Cell & Systems Biology in the Faculty of Arts & Science at U of T, and lead author of two studies examining sensory experience-dependent brain growth. "By testing whether early deficits in sensory experience similarly restrict human brain growth, our findings offer a novel approach to combatting such deficits to maintain normal brain development." Sensory experiences of newborns are critical for their developing brains as they help with the maturation of existing neural circuits. However, whether these sensory experiences also impact early neurogenesis has not been clear before now. In a study published in the Journal of Neuroscience, the researchers reared zebrafish larvae in environments with reduced lighting, limiting their exposure to visual stimulation. While they found that a dim environment does not affect body or eye growth, it does negatively impact the ability of neurons in the brain generated during the treatment period to survive. As a result, the animal is left with reduced neural capacity, presumably limiting its visual processing abilities. In a parallel study published in eLife, the researchers manipulated mobility in various ways, producing differing outcomes. By reducing the size of the accessible environment, they saw decreased physical movement that resulted in a decrease in the number of cells from which new brain cells are created – known as progenitor cells. Conversely, when they imposed a current against which the fish were compelled to swim, the amount of progenitor cells increased. "Interestingly, the experiments also showed that the sensation of movement, detected by sensory cells, increased the production of brain cells," said Hall. "Blocking the development of these sensory cells prevented the rise in progenitor cells seen in the fish who swam more. However, activating these same cells in immobilised larvae increased the number of progenitor cells, even though the larvae could not move. "This suggests that measures to simulate increased physical movement in young children could be used to combat abnormal neurogenesis during early brain growth." These findings might help explain a number of important links. Doctors in neonatal intensive care units often use massage therapy for babies born prematurely or with illnesses, which seems to be helpful for reasons not fully understood. The researchers suggest sensory feedback might be stimulating neurogenesis that in turn faciliates brain growth. In contrast, babies born with muscular dystrophy often show signs of impairment in learning and cognitive development. As the disease itself is localized to skeletal muscles, the causes of these behavioural deficiencies are mysterious. Knowing exactly how sensory experiences promote neurogenesis could open the door to post-natal interventions that ensure the development of neurons in the absence of triggers that occur under typical circumstances. "It's important to remember that while tantalizing, these links are speculative," said Tropepe. "Our findings are new and it takes time to truly understand their relevance. Nonetheless, we are excited to learn more about the fundamental nature of sensory-dependent brain growth and its potential medical applications." 1) Download the full research papers described here at https://elifesciences.org/articles/31045 and http://www.jneurosci.org/content/38/8/2000.